Giulia graduated with honours degree in physiotherapy at Universita Degli Studies Di Verona, Italy in 2014. She has accumulated comprehensive experience in various physiotherapy settings including Orthopedic, neurological, sports injuries and musculoskeletal rehabilitation in last 4 years. She has been continuously involved in learning new skills like Dry needling, Fascial manipulation, Pompages technique and mulligan joint mobilisation techniques to augment her treatment techniques. She has a special interest in treating spinal injuries including neck and back pain. She uses a combined approach of manual therapy and exercises rehabilitation to obtain an optimal recovery and prevent further injuries. 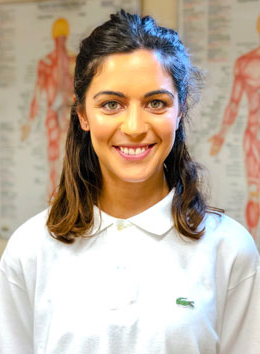 She developed a strong passion for posture therefore, she specialised in Mezières-method, based on the importance and combination of awareness of the asymmetries and auto-correction, breathing and posterior chain stretching. She believes in a combination of postural re-education and core stability.